We've had inquiries on how I custom mounted our Tough Armor Tube Front Winch Bumper for Vaterra Ascender to the RC4WD Chevy Blazer Body Set (Z-S1575) on my TF2. I've put together this DIY so you can do this to your TF2 Chevy Blazer with the exact parts I used too. But this is the fun part of our hobby, use what you have to make it work. 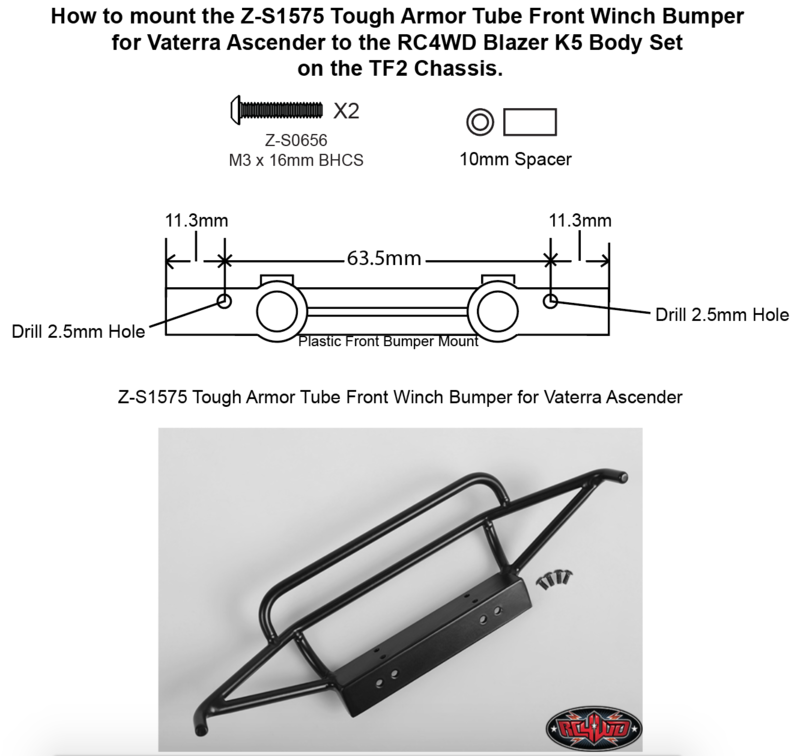 Tough Armor Tube Front Winch Bumper for the Vaterra Ascender Z-S1575 (You will not be needing the side mounts). 1. Remove the stock Blazer Bumper and remove the 3 mounting tabs used to hold the stock bumper WARNING: There is no going back to the stock bumper if you remove these tabs so make sure this modification is for you. 2. Using the dimensions provided in the image, Mark the 2 drill holes needed to mount the bumper. Make sure before you mark these holes that you do have the bumper centered to the mount. Always good go double check and triple check before you start drilling holes. 4. Using the 10mm of spacers, secure them between the Tough Armor bumper and the #1 Bumper mount with two M3 x 16mm Screws. WARNING: Do not over tighten the screws as you could easily strip the plastic hole you drilled. 5. Mount up your RC4WD Winch and head out to the trail.